As a gardener and amateur entomologist, I am fascinated by insects. Nearly ten years ago I wrote Protect Your Garden With Beneficial Bugs for Mother Earth News, and since then I have added many plants to my garden because they are so attractive to beneficial insects. I know this approach reduces problems with bad bugs. For the last two seasons, I have encountered no insect pest problems that could not be controlled with hand picking. Over a dozen new plants were recently added to the GrowVeg plant palette, including many chosen because of their value as insectary plants. For example, the dainty little flower known as sweet alyssum attracts hoverflies (also known as syrphid flies) in search of nectar. In turn, hoverfly larvae scour leaf undersides, eating aphids and mites before you ever see them. In similar fashion, phacelia attracts a wide range of beneficial insects including bees, wasps and hoverflies. The nectar produced by cornflowers is extra sweet, which is quickly discovered by little beneficial bugs. Insect populations change during the growing season, as do the plants that attract them. One of the goals of working with insectary plants is to have new things coming into bloom as others fail, so that beneficials always have a dependable supply of nectar and pollen. Numerous studies from Europe and the US have shown that an abundant food supply helps beneficial insects live longer, healthier lives. Best of all, well-fed beneficial insects have more babies, which means better pest protection for your garden. The specific insect species present in gardens varies widely with geography, but similar relationships exist between insect predators and the plants that attract them. For example, in a close observation of insectary plantings in Corvallis, Oregon, hoverflies (major aphid predators) began the season on cilantro flowers, then moved to sweet alyssum in early summer. By late summer the hoverflies showed a preference for buckwheat flowers. What’s interesting here is that over 2,000 miles away in my garden, I see exactly the same trends. But there’s more. The Oregon study showed that parasitic wasps (major caterpillar predators) were drawn to spring mustard, followed by buckwheat, followed by mint. Again, I see the same trends in my garden. When the mint and catnip bloom in late summer, I can hear the buzz of thousands of little bees and wasps long before I see them. Good insectary plants range from short-lived annuals (alyssum, buckwheat, cilantro, phacelia) to hardy perennials that like to stay put for several seasons (catnip, oregano, mints, monarda and thyme). The GrowVeg Planner will show you the best planting dates for these and other plants that please beneficial insects, but deciding where to grow insectary plants is up to you. My goal is have beneficial insects active in every part of my garden, so I tend to anchor the outside corners of my garden with weed-resistant perennials that always attract plenty of buzzers – catnip, oregano and mint, for example. Among annuals, herb fennel, dill, and sunflowers make wonderful insectary plants to station around the garden’s perimeter. 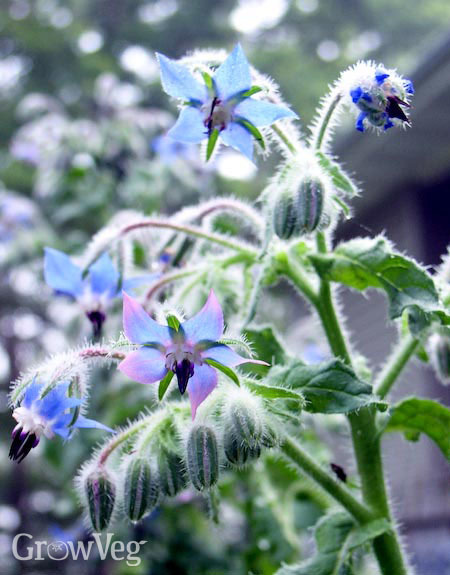 To achieve better diversity inside planting beds, I like to plant small clumps or pairs of insectary plants near crop plants, for example pairs of staked cornflowers near tomatoes, and borage twins adjacent to cucumbers. I’ll plant a pinch of buckwheat in any empty spot in summer, and I often use sunflowers to please bees while offering filtered midsummer shade to peppers and bush beans. Planting insectary plants in pairs or small clumps also sets the stage for good seed production. By far the simplest way to intersperse insectary plants with veggies is to allow selected plants to stay in the garden until they produce mature seeds, and allow many of those seeds to sprout where they fall. I have not sown cilantro, herb fennel, or borage in years because they self-sow so successfully. All I must do is pull out the excess plants when they are too numerous or too big. Just like crop plants, insectary plants provide good fodder for the compost heap as they come and go. Comfrey, buckwheat, and even borage can be grown for composting purposes alone, though it’s best to let insects enjoy most of these plants’ flowering period first. When an insectary plant grows out of bounds, don’t hesitate to clip it back or pull it out. In any competition for growing space, crop plants should always come first. Gardeners with limited space might consider a different approach – planting a large tub or other movable planter with an assortment of insectary plants. Last summer I saw an old wheelbarrow-turned-planter teeming with borage, buckwheat and alyssum – a movable feast for pollinators and beneficial bugs. Every garden is different, but if you’re a beginning bug-watcher, here are some good insectary plants that are easy to work with in a vegetable garden. Use the comments below to add your experiences and ideas. "Thank you enormously for this write-up and a wonderful range of great articles - lots to learn and do - and all fun! Thanks to the whole GrowVeg Team"
"Do you have a source for comfrey that doesn't reseed? I've heard it's a great source of "greens" for composting and makes good "tea" also. Our community garden needs more "greens" since most of our city doesn't bag their grass and we'd love to grow our own. By the way, I'm in the states but I'm sure multiple sources would be appreciated." "Barri, you need to find a stockist of the 'bocking 14' variety of comfrey and even then it's best sited away from your main garden beds - I have mine near my compost piles. In the us you can purchase it from http://www.horizonherbs.com and in the UK from www.gardenorganic.org.uk." "Fantastic article. Have already contacted numerous family members with the info. Clare"
"Thanks for this info. Do you know what bugs bees will eat in the garden? I have a lot of sunflowers and the whole garden is a buzz with bees. Thankfully they are friendly to people." "Great (and pretty) suggestions. Any suggestion for gettin the stink bugs out of my garden. There are 100s all over everything. Or perhaps how to prevent them from returning 2012?" "Do you have any advice on plants that might deter animal pests, such as voles or ground squirrels in the garden?" "Bettina, I can tell you that gophher plant does not work to deter gophers. I have these plants all over, they come back readily from seed, and the gophers have tunneled all over my garden. Trapping them is the only method that we've found to work, but only works for a season, and putting it a barrier under the garden is not an option due to the large size. One thing you might experiment with is putting up a couple of barn owl boxes in your yard. Barn owls are voracious rodent eaters, feeding at night, and can even hear the pests mining under the ground. We just put some up but was late in the season for mating and nesting so we didn't get any. Check to see if they live naturally in your area. If you do this put them up before winter. There are building instructions on the internet or you can buy them built. Good luck." "Thank you for this useful information. Although I've seen many lady bugs in my garden in the early summer, I had no idea hover flies were so benefical for ridding the garden of aphids. Thanks so much." "like the planting to benifit all seasons wanting to use companion planting, having problems remembering who goes with who what would be exceptionaly brilliant would be having it incorporated in garden planner"
"I think I've seen the hover flies on our cosmos. At first I thought they were interested in the blossoms, but then I watched them cleaning the stems with their legs, going up and down the plant. So glad to have them! The beans plants seem much happier since they're around too." "I started gardening with allyssum and dianthus and marigold and nasturtuim. I had lots of hover flies for a long time, and never had tomato hornworms at all. Then I got married and my husband decided the flowers were useless. So we got hit with hornworms all over the place! and cabbage worms. Aphids. So I am doing late season planting of these flowers. I picked up oregano too, hoping that would be a good part of the group, and I am glad I guess God told me to. " "I'm new to fruit (planted 19 fruit and nut trees bred for So Fla- so far they're getting mauled by insects; will keep researching to make it better!) and vege (patio pickers X 6- so far!- on my screened pool deck)gardening and am so happy I found your website and blog! I'm learning from reading your readers' comments- that's the beauty of blogs, right?! Thank you for a great site!" "Bettina, I had a great uncle who was a real 'down-to-earth'er. He had a way about him that all animals respected, including wild animals (He would call wild doves and pigeons, they would come to him where he would gently pick them up, and take them home to add them to his coop. The pigeons were a standard meat source for him). Anyhow ... he simply had a small windmill on a post in his yard. He said the vibrations scared (or at least annoyed them enough to make them keep their distance) ground away (or at least annoyed them enough to make them keep their distance)." "I've often wondered if whirligigs stuck in the ground around plants would deter unwanted visitors, even deer. I've only seen one reference to that before. Any experience with this? " "I've no experience with whirligigs, and that makes me realize ... I should specify, his windmill was about 30-inches in diameter (about 12-15 inches per blade). To top it off, it was a rickety old thing ... I'm sure it made quite a racket under ground :)"
"To expand this discussion a little further, I put a torn piece of bird netting over a rose bush today to see if it would deter/confuse the deer. Of course, they will probably eat it!" "Bettina: Get a few Society Garlic plants and plant around your garden. We had gophers one year and someone told me to do this. It worked great. All our neighbors around us have gophers but we don't. Society Garlic is a beautiful plant with stems that grow out of it with pretty blue flowers. The plant itself doesn't smell that good but it's not bad. Sure better than gophers. I get my plants from Lowe's or any nursery." "Another thing to consider along with the flowers is to encourage pollinators by giving them places to overwinter and lay their eggs. For several years I have been providing nesting tubes for Red Mason Bees (in the UK). These are small totally unaggressive bees which hatch out in mid-spring from eggs laid in the previous summer in cardboard tubes suspended from the eaves of my shed. They are very useful pollinators in spring when there are fewer pollinators around. After hatching, feeding and pollinating the females lay eggs, along with pollen as a food source, in the tubes which they seal with mud. The tubes then remain until the following spring, when it all kicks off again! Also it is worth considering placing a log pile in the growing area, this will attract various beneficial insects to nest and over-winter." "Thanks for writing this post! It sure sounds like it will be of use in mapping out my battle plan against the cucumber beetles and squash bugs!"